licensing, credit dispuates and more. Commercial and Residential real estate transactions (purchase, sell, exchange) and all related matters. Please call (617) 542-4066.
and other areas of practice. We are a general practice firm familiar and experienced in handling different and difficult legal matters. 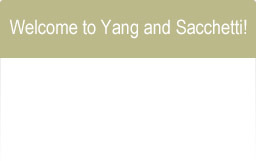 Yang and Sacchetti is especially successful and experienced in immigration, family, business, criminal, and related legal matters.